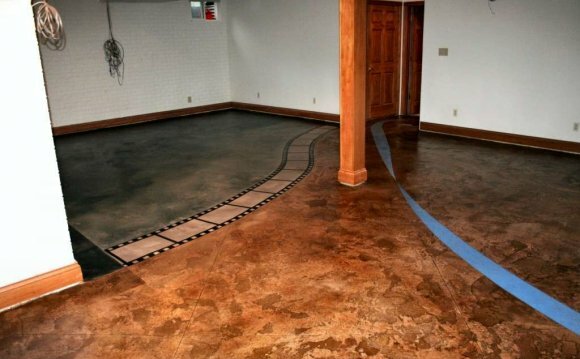 Worried about your damp basement floor? As you know only too well, a damp basement floor can lead to all sorts of problems including mold, mildew, unpleasant odors, cardboard boxes turning moldy and disintegrating, and permanent damage to stored items. To a large extent, many of the problems arise because of insufficient air circulation and particularly the inability of the flooring to dry out rapidly after it has become damp. So if you could install a raised ‘floating’ floor which not only allows air to freely circulate underneath the flooring but prevents water from tracking upwards to the surface of the basement flooring, then many dampness issues can be solved. And HandyDeck tiles are very easy to lay on your basement floor since they just click together over the existing surface…. no surface preparation or adhesives needed. What’s more, if you decide to move, you can simply lift them up and move them to your new location. Even if your new home don’t have a basement, because these tiles are so versatile, you could use them as outdoor flooring on a balcony, patio, rooftop or whatever at your new location. But in the majority of cases, for a quick and easy way of alleviating dampness problems, just laying down HandyDeck deck tiles as your new basement flooring could be the simplest and most cost effective solution.